Pirates Cove Activity Pool has an authentic 40 foot pirate ship with a simulated cannon battle and Caribbean sound. Our foam padded Cardiac Canyon River Run is loaded with caverns, waterfalls, and sudden drops and turns. 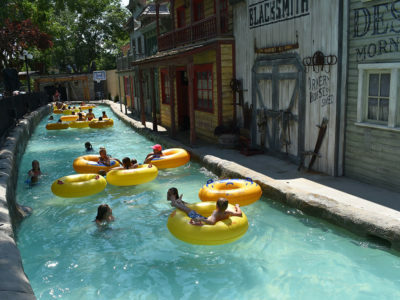 Our Grant’s Gulch Lazy River has an endless river of fun that you float and soak in. The newly themed Double Dragons are enhanced water slides with fog and lighting in the tunnels. All of this … plus your choice of 2 Swimming Pools to soak and sun at. King of the Hill Pass Combines All Day use of the Waterpark & dry activities! BEST VALUE!